• Helps tape and film adhesion. • Fast and easy to use, only one coat is required, so less product is used per application. • Removes easily using skin cleanser or soap and water, so unsanitary residue isn't left in or around the wound area. • Applies easily, even on awkward areas such as elbows, knees, and heels. Moves naturally with patients' skin and won't crack or peel. • Allows skin to "breathe" so tapes and films adhere better. • May increase intervals between dressing changes. • Apply as a coating to prepare the skin for adhesives. • Provides a protective interface that may reduce friction during the removal of tape. • For skin attachment sites: drainage tubes, external catheters, surrounding ostomy sites and other adhesive dressings. • For use in sensitive stoma areas as a skin protectant. • May reduce irritation from contact with body wastes and stoma fluid. • Forms a protective film on skin which may reduce exposure to urine and feces. • SKIN-PREP should only be used on intact skin. • Skin should be clean and dry prior to application of SKIN-PREP. • Apply a uniform coating over entire area you wish to protect, i.e., around stoma, under dressing, catheter site, etc. • SKIN-PREP will dry in approximately 30 seconds. If you miss an area that you intended to cover, wait until the original area of application has dried, then reapply to the missed area. • For maximum protection, an optional second coating of SKIN-PREP may be applied and allowed to dry before covering area with dressing or other adhesive product. • If SKIN-PREP is applied to an area with skin folds or other skin-to-skin contact, make sure that skin-contact areas are separated to allow the coating to thoroughly dry before returning to normal position. • The removal of adhesive products may also remove SKIN-PREP, so reapplication is necessary any time that adhesive products are changed. 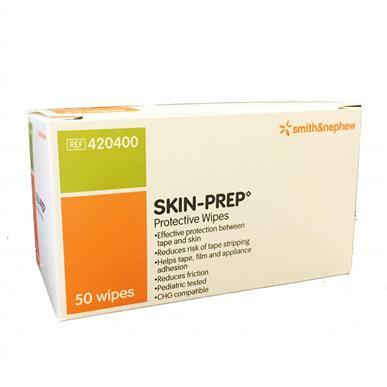 • Removal of SKIN-PREP is not necessary before reapplication. Clean and dry the area and apply fresh SKIN-PREP as directed above. Sold by the box, 50 individual foil-pack wipes per box.